"For a long time past the Navajoe [sic] Indians have murdered and robbed the people of New Mexico. Last winter when eighteen of their chiefs came to Santa Fe to have a talk, they were warned, -- and were told to inform their people, -- that for these murders and robberies the tribe must be punished, unless some binding guarantees should be given that in [the] future these outrages should cease. No such guarantees have yet been given: But on the contrary, additional murders, and additional robberies have been perpetrated upon the persons and property of unoffending citizens. It is therefore ordered that Colonel CHRISTOPHER ["KIT"] CARSON, with a proper military force proceed without delay to a point in the Navajoe country known as Pueblo Colorado [now Ganado, Arizona], and there establish a defensible Depot for his supplies and Hospital; and thence to prosecute a vigorous war upon the men of this tribe until it is considered at these Head Quarters that they have been effectually punished for their long continued atrocities." "...all those Navajoes who claimed not to have murdered and robbed the inhabitants must come in [surrender] and go to the Bosque Redondo [a concentration camp at Fort Sumner, on the Pecos River, in east central New Mexico], where they would be fed and protected until the war was over." "Those who surrendered were started on a walk to Fort Defiance [in northeastern Arizona], but it was bitter cold and they stopped at a house where they lay on the floor. Some died of hunger there. It is not known how long the remainder stayed there. At Fort Defiance they were given rations again which made many Navajos sick and killed some. "When they left Fort Defiance, ox wagons carried their food, and they followed on foot all the way to Fort Sumner [the "Long Walk"] where they spent four years. For rations they received the same things that they had got while they were at Fort Defiance..."
At the beginning of 1863, the Navajos, a diverse, widely scattered and profoundly spiritual people had lived for centuries in the arid region bounded by the San Francisco Peaks in north central Arizona, the Hesperus Peak in southwestern Colorado, Mount Blanca in south central Colorado and Mount Taylor in northwestern New Mexico. They lived as shepherds, farmers, hunters, wild plant gatherers and enterprising and far-ranging raiders. They called themselves the Dine, or the People. They called their land the Dinetah. To the Dine, their expulsion from Dinetah and the forced march  the "Long Walk"  to Fort Sumner must have seemed like the descent into Dante’s Inferno, with the famous words "All hope abandon, ye who enter in!" inscribed above the gate at the entrance. They left behind a vast mosaic of sacred mountains, spectacular canyons, colorful desert plains, scattered pasturelands, riverine farmlands, oak/juniper/pinyon woodlands, open ponderosa pine forests, pure streams and significant game. They took up a new life on an overcrowded and gloomy prairie with no building materials, short grass, limited arable soil, few trees, minimal firewood, alkaline water and little game. They feuded with the Mescalero Apaches, their neighboring prisoners at the Bosque Redondo and Fort Sumner camp. They suffered attacks by the Comanches and Kiowas, their traditional enemies from the plains. They lost women and children to predatory Hispanic and Anglo settlers, the last slavers in America. The Long Walk Trail began at Fort Defiance, a concentration camp located in northeast Arizona at the mouth of Canyon Bonito (meaning, ironically, "Pretty Canyon"), at an elevation of more than 6800 feet, in the heart of the Dinetah. It followed a roughly 400-mile-long route eastward. It ran southeast across the Colorado Plateau, through mesas and canyons of sandstone, past mountains with timbered slopes, and around and across sheets and rivers of frozen lava. At the Rio Grande, it turned northeastward, through basin and range country up to the southern foothills of the Sangre de Cristo mountain range. It turned southeastward, passing from the southern tip of the mountains down into the western edge of the Great Plains’ short grass prairie lands. The trail ended at the Bosque Redondo  "Round Wooded Area"  a grove of cottonwoods near the site of Fort Sumner, on the Pecos River. From Fort Defiance  a hateful place of appropriated grazing land, bitter conflict, and Navajo suffering  the trail led east-southeast for some 100 miles past Fort Lyon and Bluewater Creek to Fort Wingate, according to Frank McNitt in his book The Long March: 1863-1867. (In 1868, the Army moved Fort Wingate lock, stock and name from its original location, just southwest of the 11,300-foot-high volcano Mount Taylor, to Fort Lyon, a few miles east of Gallup.) According to Neal W. Ackerly in his study "A Navajo Diaspora: The Long Walk to Hweeldi [Fort Sumner]," the trail continued east-southeast from the original Fort Wingate, passing the community of Cubero and the pueblo of Laguna. It followed the Rio San Jose downstream to its juncture with the Rio Puerco. It crossed basalt-strewn desert land to the Rio Grande and the community of Los Pinos, or Peralta. It turned upstream, following the left bank of the Rio Grande past the Isleta Pueblo to Albuquerque, completing a segment of another 100 miles. From a site called Sheep Springs, on the Rio San Jose, the trail apparently forked, with a shortcut heading almost due east directly into Albuquerque, bypassing Los Pinos. 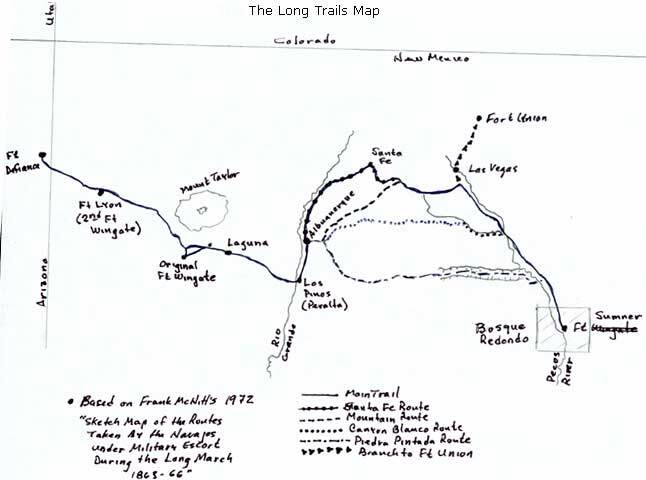 From Albuquerque, the trail divided into four branches, although only two, the "Santa Fe Route" and the "Mountain Route," served as primary trails, according to Ackerly. 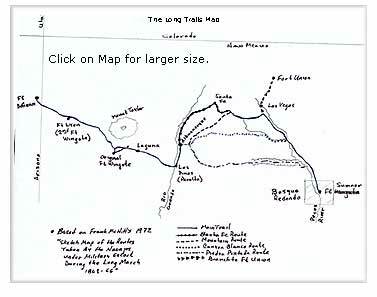 The Santa Fe Route followed the old Chihuahua Trailthe northernmost segment of the fabled Camino Real de la Tierra Adentro (the Royal Road of the Interior Land). This well-traveled roadway led upstream past the pueblos of Sandia, San Felipe and Santo Domingo. It then veered from the Rio Grande, following a tributary into Santa Fe. From there, the branch followed the Santa Fe Trail to a point a few miles southeast of Glorietta, a Civil War battle site. Meanwhile, the Mountain Route ran eastward out of Albuquerque through Tijeras Pass, between the Sandia and Manzano mountain ranges. It turned northeast, passing through San Antonito, Golden and Galisteo, meeting up with the Santa Fe Route at the point southeast of Glorietta. From there, the reunited branches followed the Santa Fe Trail eastward past the Pecos Pueblo, a prehistoric and historic trade center. A few miles farther east, the route forked and forked again, into several new branches. One branch continued northward, on the Santa Fe Trail, following it past Las Vegas, an 1835 Mexican land grant community, clear into Fort Union. From there, it doubled back southward, toward Fort Sumner. All the branches followed the Pecos River drainage downstream into Fort Sumner. The Canon Blanco (White Canyon) and Piedra Pintada (Painted Rock) routes out of Albuquerque ran through Tijeras Pass. The Canon Blanco Route bore northeast then due east across arid grasslands to the Pecos River. The Piedra Pintada Route bore southeast then due east across the grasslands to the Pecos. Both followed the river downstream to Fort Sumner. According to Ackerly, the Canyon Blanco Route "does not appear to have been used extensively during the Long Walk period." The Piedra Pintada Route may have been used during the Long Walk period only by Navajos trying to flee westward, away from the Bosque Redondo and Fort Sumner, back to their homeland. The longest route from Albuquerque to Fort Sumner approached 250 miles, the shortest route, about 150 miles. By any route, the Long Walk Trail led to hardship and misery. Brigadier General Carleton, commander of the Department of New Mexico (which at the time encompassed both New Mexico and Arizona) during the Civil War, aimed the weapon and pulled the trigger in the campaign to expel the Navajos from their homeland. Kit Carson served as his bullet. Carleton, a vainglorious man denied the opportunity for fame in the Civil War, "decided he would win it in New Mexico by getting rid of the Indians and opening their lands  which he was convinced contained uncountable riches in gold and silver  to prospectors," said Raymond F. Locke in The Book of the Navajos. In late 1862, Carleton ordered Kit Carson and his regiment to attack the Mescalero Apaches, already a dispirited and defeated people, and to kill all the men "whenever and wherever you can find them... ...you are there to kill them." The "complete savagery of this order shocked and embarrassed Kit Carson," said C. L. Sonnichsen in his book, The Mescalero Apaches, "but he could do nothing but follow orders." Early in 1863, Carleton sent a force to crush the Chiricahua Apaches in the Gila Mountains of southwest New Mexico. He applauded his troops after they treacherously murdered and beheaded the great old chief Mangas Coloradas. Carleton felt confident that he had defeated the Chiricahuas. (In fact, they would fight stubbornly and savagely for another 25 years.) He then issued his infamous Order No. 15 for Kit Carson to strike the Navajos, who, like the Mescaleros, were already a disheartened, beaten people. "...prosecute a vigorous war upon the men of this tribe until it is considered at these Head Quarters that they have been effectually punished..." Carleton ordered. And live to see the country free from Johnny Navajo. We’ll first chastise, then civilize, bold Johnny Navajo! The dutiful Kit Carson, a naturally modest man now suffering from failing health, took up the cudgel against the Navajos in the late summer of 1863, launching a scorched earth campaign in the Dinetah. As fall came on, he sent forces from Fort Defiance to burn the Navajos’ crops, destroy their food caches, raze their hogans, poison their water, and shoot their horses and sheep. As the first snows fell, he dispatched patrols to harass Navajo bands, preventing them from hunting game or gathering wild food plants. "There is hardly a Navajo family that cannot remember tales of an aged grandfather, a pregnant mother or a lame child that had to be left behind when a camp had to be quickly deserted..." said Locke. "Mothers were sometimes forced to suffocate their hungry, crying babies to keep the family from being discovered and butchered by an army patrol or taken captive by the slave raiders." Meanwhile, the Utes, Hopis and Zunis capitalized on the Navajos’ vulnerability. 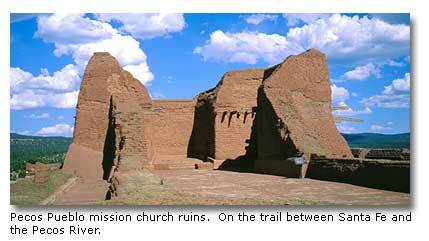 They attacked Navajo bands, capturing women and children for slaves. Smelling blood, the Comanches and Kiowas came all the way from the southern Great Plains to raid and pillage the Navajos. While the war to end black slavery took its terrible toll in the east, Hispanic and Anglo slaving parties in Arizona and New Mexico stole Navajo women and children like plunder from the harried bands and bought Navajo women and children from the Utes. "They are bought and sold by and between the inhabitants at a price as much as is a horse or ox..." said Kirby Benedict, Chief Justice of the New Mexico Supreme Court, as quoted by Ackerly. "A likely girl of not more than eight years old, healthy and intelligent, would be held at a value of four hundred dollars, or more." 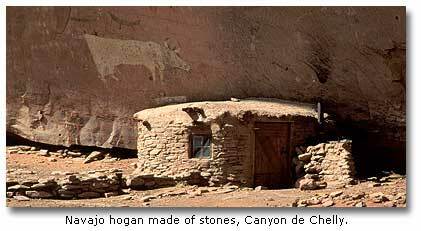 Thousands of Navajos, typically the more prosperous, fled with their horses and cattle. Many headed westward to remote chasms in the Grand Canyon area; and others, eastward to sanctuary at traditionally friendly pueblos such as those of the Jimez people. Thousands of other Navajos, despairing and impoverished, began to believe that confinement at Fort Sumner could not be worse than the awful siege they endured in their beloved Dinetah. 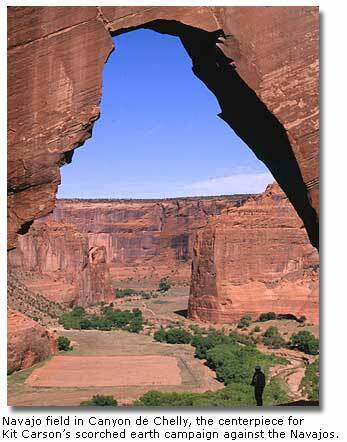 Near the end of the rampage through Canyon de Chelly, a Navajo man named Hastiin Biighaanii (Mr. Backbone), came to Kit Carson under a flag of truce. "You have killed most of us," Biighaanii told Carson, according to Clifford E. Trafzer in his book The Kit Carson Campaign: The Last Great Navajo War. "There are no more Dine now. They are gone. Maybe a few are alive in other areas. You have killed us, and there is nobody left for you to kill. Besides, we have nothing; we are suffering very much from hardship. We want to stop here; we want peace." She holds him as the conqueror of Johnny Navajo. "I beg to congratulate you and the country at large on the prospect that this formidable band of robbers and murderers have at last been made to succumb..."
Scott Smith, Manager of the Fort Sumner State Monument, believes that the Navajos dispatched from Dinetah to Fort Sumner numbered, not the 5,000 estimated by Carleton, but somewhere between 10,000 and 12,000, according to notes he gave me in August of 2002. The military swiftly found itself overwhelmed by Navajo captives. It could not adequately feed, provision or transport them. At Fort Defiance, according to Trafzer, the troopers had virtually no blankets to give to the threadbare Indians, who suffered and died from the cold. The soldiers could not offer medical care to their charges, who died of diseases. The army commissary gave wheat flour to the Indians, who tried to eat the strange new food raw or as gruel. They died of dysentery. The military had too few wagons to transport all the old, crippled and young the 400 miles to Fort Sumner. Many of the infirm would have to walk. Carleton’s soldiers marched the Navajos eastward, not as a single column of refugees all at once, but rather as more than 50 fragmented caravans of the damned over a period of nearly three and one half years, from August of 1863 to December of 1866. Lieutenant E. E. Latimer delivered perhaps the smallest number, five, to Fort Sumner on November 7, 1863, according to Scott Smith’s notes. Captain John Thompson delivered the largest number, 2,400, on April 13, 1864, completing a trek of 41 days. "The route of the Long Walk was marked by the frozen corpses of Indians, who, too fatigued to go on, had crawled to the wayside to die," said Lynn R. Bailey in his book The Long Walk. The Navajos mourned as their sick, lame and malnourished collapsed beside the trail, abandoned and left where they fell. The refugees struggled to survive on inadequate rations. They fell on their spent and dying horses, butchering the animals for the meat. Clothed with no more than rags, they froze in the snows of winter. Weak and exhausted, they drowned in crossings of swollen streams. Defenseless, they lost their belongings to thieves and their children to slavers. On some marches, they watched scavenging coyotes, vultures and crows  harbingers of death  track the caravans, waiting for the next victim. Sometimes, after they left a relative dying beside the trail, the Navajos heard the crack of a soldier’s musket in the distance, to the rear of the column. In a letter to his wife, Lieutenant George H. Pettis, who escorted a party of Navajo refugees to Fort Sumner in February of 1864, reported that he had left Los Pinos "in charge of 243 Navajo Indians, 81 of whom were men, the balance were women and children; the Indians comprised all ages, from the old man or woman of a hundred years, to the sucking babe..."
In a report (published by Kelly) to Carleton’s Assistant Adjutant General, Captain Joseph Berney, who escorted refugees to Fort Sumner during the early months of 1864, reported that during the march from Fort Defiance to Los Pinos, "the Indians suffered intensely from the want of clothing, four were entirely frozen to death..." and during the march from Los Pinos to Fort Sumner, "I lost fifteen Indians on the road, principally boys, three of which were stolen, two strayed from my camp on the Rio Pecos, and ten died from the effects of the cold..."
In perhaps the most detailed report (also published by Kelly) by the military, Captain Francis McCabe, who led a punishing march to Fort Sumner in the spring of 1864, said that he left Fort Defiance "with eight hundred Navajo prisoners..."
"I placed as many of the women, children and old people as possible in wagons, and had one empty wagon placed every morning under control of the Officer of the day...to receive such sick and aged indians as might have given out on the march. "The main body of the Indians traveled between the advance Guard and the train [of wagons], and in advance of my company... On the second days march a very severe snow storm set in which lasted for four days with unusual severity, and occasioned great suffering amongst the indians, many of whom were nearly naked and of course unable to withstand such a storm." McCabe reached Fort Wingate on March 29th, obtaining "a fresh supply of rations for the indians; but only in the proportion of half a pound of flour, and half a pound of beef to each..." That would have to last until the party reached Los Pinos, where McCabe finally managed to secure adequate supplies and rations. After a delay of several weeks and an addition of 146 new prisoners at Los Pinos, McCabe pushed on for Fort Sumner, arriving there on May 11. He claimed, "...the Navajoes were greatly delighted and expressed great satisfaction with what they saw." During the journey, however, McCabe lost more than 150 of his prisoners. Nearly 50 escaped. More than 100 died. Kit Carson, hearing of the loss of Navajo life, notified Carleton that the deaths were attributable to "want of a sufficiency to eat. I respectfully suggest to you the propriety and good policy of giving the Indians...while en route to Basque Redondo, sufficiency to eat." If McCabe’s Navajos were "greatly delighted...with what they saw" when they arrived at Fort Sumner and the Bosque Redondo, they would soon come face to face with reality. Under the watchful eye of Carleton’s soldiers, the Navajos shoveled out miles of irrigation ditches, which often washed away under floodwaters from the Pecos River. With their bare hands, they grubbed mesquite shrubs to open fields, where their crops would fail under successive sieges by insects. In the absence of building materials, they tried to raise shelters of sticks and worn hides and cloth, which offered little protection from the fierce winds of a prairie winter storm. Unable to grow sufficient crops for food, they tried to survive on military rations of rancid bacon and weevil-infested grains. They quarreled with the Mescaleros, long-time enemies whom Carleton imprisoned at the same camp. They suffered raids by the Comanches and Kiowas, from the plains to the east. "My dear wife," Pettis said in his letter, "this is a terrible place... The Rio Pecos is a little stream winding through an immense plain, and the water is terrible, and it is all that can be had within 50 miles; it is full of alkali and operates on a person like castor oil, -- take the water, heat it a little, and the more you wash yourself with common soap, the dirtier you will get." "Fair Carletonia," Fort Stanton and the Bosque Redondo came to be called, in derision. Two thousand Navajos died there, according to an article, "Long Walk of the Navajos," published by S. J. Reidhead in Wild West Magazine, December 2001. Some felt touched by the anguish of the Navajos. Soldiers tried to adopt Navajo children and give them better homes, and some officers did all they could to comfort their charges during their harsh journeys, according to Ackerly. Kit Carson requested that two young women prisoners be given bright red blankets, rather than the usual dull gray ones. "And they got them," according to a report by Pettis, quoted in E. L. Sabin’s Kit Carson Days: 1809-1868. Sensing potential disaster and fearing personal embarrassment, Carleton wrote in a letter (published by Kelly) to Brigadier General Lorenzo Thomas, Adjutant General, U. S. Army on March 12, 1864: "The Exodus of this whole people from the land of their fathers, is not only an interesting but a touching sight. They have fought us gallantly for years on years. They have defended their mountains and their stupendous [canyons] with a heroism which any people might be proud to emulate. But, when at length they found it was their destiny, too, as it had been that of their bretheren [sic], tribe after tribe, away back towards the rising of the sun, to give way to the insatiable progress of our race, they threw down their arms, and, as brave men entitled to our admiration and respect, have come to us with confidence in our magnanimity, and feeling that we are too powerful and too just a people to repay that confidence with meanness or neglect..." Carleton pled with Thomas to rush provisions, clothing, agricultural implements, tools and cooking utensils to the captives at Fort Sumner at rapidly as possible. "Almost all...had to walk the whole waymaybe three hundred miles or more. The women folks and the men folks carried most of the children, and when they got tired others would take turns. There were some wagons to haul food, old people and little children. The soldiers and Mexicans rode horses. The Navajos were just provided small amounts of food that they ate with water that they carried with them." "According to my great-grandmother, when the journey to Fort Sumner began the Dine had hardly anything to comfort them or the keep warm, like blankets. Women carried their babies on the backs and walked all the way hundreds of miles. They didn’t know where they were headed. Finally, the Dine reached their destination, but they were to shed many tears during their stay at Hweeldi. The rations that were give out were unfamiliar to them and made them sick, and many died of the food..."
"‘Go ahead,’ the daughter said to her parents, ‘things might come out all right with me.’ But the poor thing was mistaken, my grandparents used to say. Not long after they had moved on, they heard a gunshot from where they had been a short time ago." "On the journey to Hweeldi... the people had to walk. There were a few wagons to haul some personal belongings, but the trip was made on foot. People were shot down on the spot if they complained about being tired or sick, and if they stopped to help someone. If a woman became in labor with a baby, she was killed. There was absolutely no mercy." "After several years at Fort Sumner, life became very hard for the Navajos. There was no wood for fires; there weren’t enough seeds to grow their crops, which would hardly grow in the poor ground, anyway; and insects ate what did come up." "If a rat was killed, the meat, with the bones and intestines, would be chopped into pieces, and twelve persons would share the meat, bones and intestines of one rat." "Some boys would wander off to where the mules and horses were corralled. There they would poke around in the manure to take undigested corn out of it. Then they would roast the corn in hot ashes to be eaten." "Our people had to dig trenches and holes in the ground to be used as shelters. Some cows were slaughtered, and the hides were used for shade and windbreaks. After the bushes and small trees had been cut and burned, the people had to dig [mesquite roots] for firewood." "A lot of people got lice at Fort Sumner, especially in their hair. The men’s hair, like the women’s, was pretty long in those days." "Many people died at Hweeldiof various diseases, starvation, exposure and attacks by enemies. "Wolves also were one of the worst enemies. People couldn’t go outside their huts after dark. A few goats that were kept nearby gradually were killed off by the wolves during the nights until finally only four or five were left." "At the beginning of the third year (and even earlier), the Navajos started asking humbly to be sent back to their own country. They had brought the matter up tentatively in the second year. During the third year women, young men and girls cried, and the men said, ‘We miss our country; give our country back to us.’"
In 1868, three years after the guns of the Civil War had fallen still, America addressed the anguish of the Navajos. Between 1865 and 1868, according to Locke, the Executive Branch investigated. Congress investigated. The Department of Interior investigated. The Army investigated. They all declared themselves "appalled." The Secretary of War relieved the autocratic Carleton of duty in 1866, assigning him to a post in Louisiana. Finally, in the spring of 1868, General William T. Sherman came to Fort Sumner. He sat down to negotiate a change with the Navajo chief Barboncita and other tribal leaders. "I hope you will not ask me to go to any other country except my own," said Barboncita. Outside the council, "women clutched [Sherman’s] coat," said Locke, and with tears in their eyes begged him to send them home. ...he was visibly moved..." On June 1, Sherman agreed to send the Dine home to Dinetah, provided they ceased raiding and observed much-reduced boundaries. Further, he promised that America would give the Navajos seed stock and tools to help them get a new start in life, and America would help liberate their children from slavery. This time, America kept its promise. At sunrise on June 18, 1868, the Navajos, in a ten-mile-long column, put Fort Sumner and the Bosque Redondo behind them forever. "...it was as if the whole of them were lifted by the wind..." said Johnny Rustywire in his story "Althabah, a Young Navajo Girl and the Long Walk of 1868," which appeared in the online journal, Star Mountain  Navajo Life. Except for Fort Sumner, few of the military installations that figured prominently in the Navajos’ Long Walk have been developed into significant tourist attractions, but you can parallel a significant part of the route  now a National Historic Trail  by following modern highways. If you begin at the community of Fort Defiance, in northeastern Arizona, you would follow State Highway 12 south through Window Rock to U. S. Highway 264, which you would follow east to the Navajo village of Yah-ta-hey. Turn south on U. S. Highway 491 (formerly Highway 666), following it to Gallup and Interstate Highway 40, where you will turn east. Within eight or 10 miles you will pass near the site of Fort Lyon (or, the second Fort Wingate), a few miles south of the highway. At Grants, you will pass just north of the original Fort Wingate, located near the village of San Rafael. Continuing east on IH 40, you will come to the intersection of State Highway 6 about nine miles out of the village of Mesita. You can follow SH 6 to Los Lunas, then turn north on SH 47 to Peralta, or Los Pinos. You can continue on SH 47 north past the Isleta Pueblo into Albuquerque. From Albuquerque, you can trace the Santa Fe Route by following IH 25 and U. S. Highway 84 into Santa Fe, or you can trace part of the Mountain Route by taking IH 40 east through Tijeras Pass, then turning north on State Highway 14 into Santa Fe. You would then follow IH 25 east to Romeroville, which is near various branches of the Long Walk. From Romeroville, turn south on U. S. Highway 84 to IH 40, turn east to Santa Rosa, then turn south on U. S. Highway 84 (again) to Fort Sumner. While it doesn’t overlay the Long Walk exactly, the route, roughly 420 miles long by modern highway, will give you a sense of the mesas, canyons, lava flows, river basins, mountain ranges and prairie lands which defined the trail. Along the way, you should stop at Window Rock, the Navajo Tribal Headquarters, to see the massive sandstone hill with the circular opening that gave the site its name. At Gallup, you will find some of the best trading posts in the Southwest. At the Laguna Pueblo, the small mission church interior is an exquisite blend of Catholic and Pueblo spirituality. Near Grants, you will pass through the northern margin of the Malpais Lava Beds, a national monument that stands as a record of primal natural violence in the desert only a few centuries ago. North of Los Pinos, you should stop at the Isleta Pueblo to visit the mission church, one of the most famous of Spanish Colonial times. It was to this church that Senora Maria Jesus de Agreda  the fabled "Lady in Blue"  a mystic Spanish nun of the 17th century, traveled spiritually (by what the Church called "teleportation") to assist in the celebration of a mass. The attractions from Albuquerque to Santa Fe, by IH 25 are well known, but you would find the alternate route, through Tijeras Pass and up State Highway 14, will take you through several quaint villages with delightful histories. East of Santa Fe, not far north of IH 25, the ruins of the Pecos Pueblo, a prehistoric and historic trading site, recall the cultural mixing of village farmers, Plains Indian raiders, Spanish conquistadors and Santa Fe Trail merchants. Finally, at Fort Sumner, you will find near the Pecos River and its alkaline waters the reconstructed foundations of walls of military installations, a museum of the Navajo Long Walk period, and  with good timing  a guided tour and living history demonstrations, reminders of a sorrowful period in the legacy of a people.